Emerald is a custom window decorator which was shipped with Compiz. It decorates windows borders and title bars by installing and editing themes. Emerald has been discontinued, but the latest v0.9.5 works great in all current Canonical supported Ubuntu releases. Webupd8 team has created a PPA for Ubuntu 13.04, Ubuntu 12.10, Ubuntu 12.04. 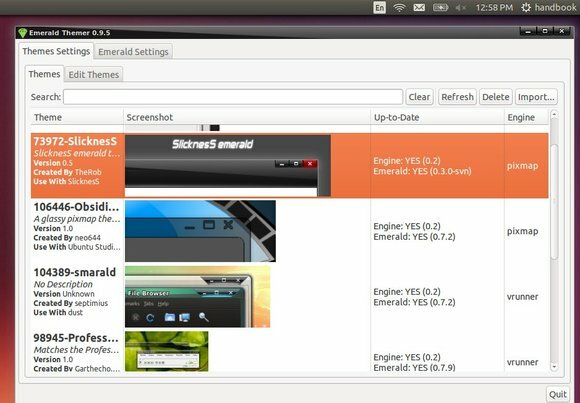 Here’s how to install and use Emerald in Ubuntu 13.10. Been a long fan of Emerald and missed its deprecation from Linux distro’s. About to install Mint 16 Cinnamon because with the new effects reminiscent of the old Compiz days. If I install emerald as above, how will the new effects in Cinnamon be affected, or will downloading CCSM also pull in compiz-core compliz-plugins etc. which will then knock out Cinnamon effects when you type “emerald –replace”? How will this affect the new Expo effects in Mint 16 Cinnamon? please help me. i put commands in terminal since ./autogen, but later commands, as make, it says that not order found. please excuse me for my english. juan@juan-SATELLITE-L855 ~/emerald-0.9.5 $ make cleanmake: *** No hay ninguna regla para construir el objetivo «clean». I don’t think this works with Cinnamon.